On-site training sessions are held at our modern headquarters, where you are provided with a fully-equipped workspace and get to work closely with other participants. Throughout the session, you have the chance to speak directly with Shopware team members and can become certified at the end of the training programme. New Our template and developer trainings as well as the certifications are also available online. This course teaches you how to make template customizations and work with the technology behind the system. The implementation of a separate sample template is as much a part of this workshop as the development of a simple plugin. Upon completion, you will receive a certificate of participation. There is a minimum of 10 participants* for live trainings. *If the required minimum of participants is not reached 10 days prior to the training, we will inform those already registered and suggest an alternative date. If you are unable to attend the alternative date proposed by us, the booking will be cancelled free of charge. In case of cancellation, you have up until 10 days before the training to receive a 100% reimbursement of the training cost. Cancellations made after this point will receive a 50% reimbursement. Shopware's responsive template offers modern solutions that significantly simplify the legwork of creating a storefront that's as unique as your brand. 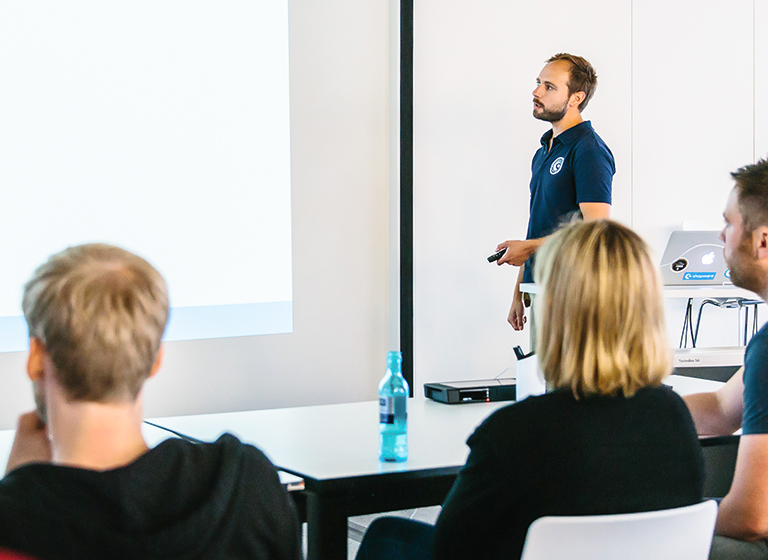 Together with experienced developers, this two-day course teaches you how to apply Shopware's technologies to create your own individual templates. After successfully completing a short exam at the end of the training, you will become a certified "Advanced Shopware Template Developer". The training teaches you about the technology and structure of Shopware 5 - from setting up a development environment and working with the plugin structure to creating templates and using events. Throughout the course, you will also learn about dependency injection and how to create your own service. Test to become a "Shopware Certified Developer"
This course covers working with Doctrine, backend development with ExtJS and the technology behind Shopware 5. You can also get tips for adapting Shopware as well as plugin development. Test to become a "Shopware Advanced Certified Developer"
In this individual training course you will get to know Shopware in detail and learn everything you need to be able to provide your customers with in-depth and professional advice. We will introduce you to both the software and the company. You will understand the advantages of the software and get a deep insight into the services and possibilities of the Shopware partner program. For example, we will explain to you which marketing options are available to you as a partner. The training course is aimed primarily at all sales-oriented employees of Shopware partners. This one-day course provides you with practical, first-hand experience with Shopware and its main features. Guided by Shopware experts, you’ll gather a comprehensive overview of our trendsetting software and learn how to create a unique shopping experience for your online business. In the Academy, you will learn exclusively from professionals who are deeply rooted in all topics related to Shopware. Located in the heart of Münsterland and hailed as the aspiring Silicon Valley of Germany, you will find the Shopware headquarters in Schöppingen. Close to Münster, the Osnabrück airport and A31, Schöppingen is easy to reach. Below you will find directions to our recommendations for hotels in Schöppingen. We look forward to welcoming you!